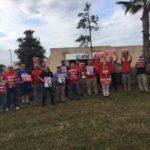 With contract bargaining beginning in early February 2018, Communication Workers of America from AT&T Mobility in District 3, AT&T Midwest, and Legacy AT&T held informational pickets at many locations across the country. 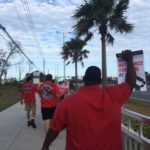 Members of CWA Local 3102, along with fellow labor activists, gathered Monday, January 22nd in front of an AT&T Mobility store in Daytona Beach, FL. 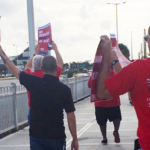 Philip Farruggio, President of CWA Local 3102, stated “the reason we conducted a mobilization effort in front of that AT&T corporate retail store was multifaceted. 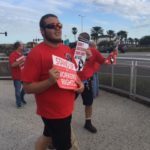 As many remember, the moment President Trump signed huge corporate tax cuts into law, AT&T announced that they would be giving out $1000-dollar bonuses to employees ($3000 short of Trump’s tax cut promise to working people), generate 7000 new good paying jobs, and invest over $1 billion dollars back into its infrastructure.